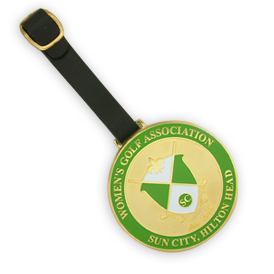 Be the envy of your friends on the greens with this Custom 2 1/2" Bag Tag. Up to four soft enamel colors. For 24k Gold plating, antique gold or antique silver finish, add 20%. For each additional soft enamel color please add, .28(C) per color. Pre-Production sample available for $50.00(G) plus die charge. Add two weeks to delivery time.